I’ve never run a competition on my site before, but the other week I was kindly delivered a bottle of Jameson, special edition, Great Escapes. I loved the concept, even though, I must admit I’m not a whiskey drinker, except when I’ve a cold. However, I love the bottle and I know when my ‘kind of’ father-in-law arrives in September he will enjoy every last drop. He’s been looking forward to it since I sent him the photo! So what is it? Well, Jameson have just launched The Jameson Great Urban Escapes Limited Edition Bottle, inspired by the sights and sounds of the world’s greatest cities. It’s inscribed with an insider’s guide to discovering the bars a local would recommend. Locations depicted on the bottle include London, New York, Paris, Moscow, Sao Paulo and Stockholm. 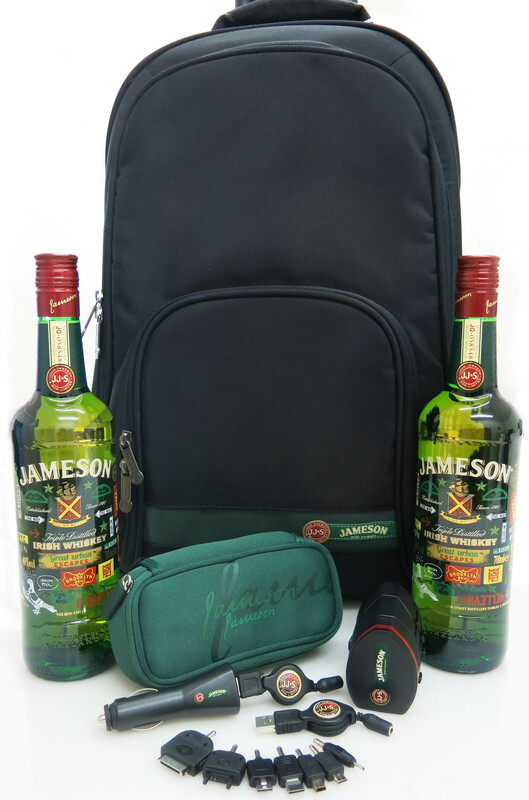 They’ve offered my readers a premium Jameson carry-on suitcase and a branded worldwide travel charger/adapter. The prize also includes one of the limited edition bottles for you and a friend. I figured, well, it’s the Bank Holiday weekend, so why not spread the joy? So, if you fancy winning, all you have to do is ‘Like’ this post or my facebook page or tweet me @juliannemooney and tell me – What’s your top travel tip for where you live? Best travel tip for kenmare : bring bikes, eat in packies restaurant, enjoy best fresh salmon sandwiches in pub in kilmacalogue, walk old Killarney rd, visit dereen gardens and enjoy great pint in mccarthys! Everyone was suggesting Packies, but it was full! We went to the Lime Tree Restaurant which was delicious! I’ll have to do Packies next time!